Here at Rockford Mutual Insurance Company, we understand that there is more value behind insurance coverage than meets the eye. That’s why we offer more than just a simple payment when you endure a covered loss, we provide a large team of hard working, friendly and proactive associates who take pride in helping policyholders recover from devastation every single day. Not only do we provide the settlement you deserve, we provide the support that you need! 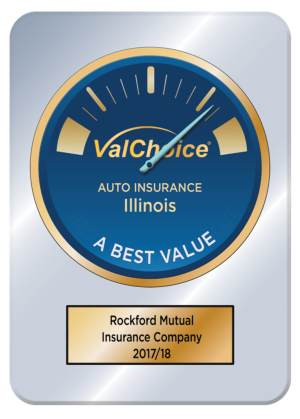 Thanks to the hard work of every associate at Rockford Mutual, we were honorably awarded the ValChoice® award for “A Best Value” in Illinois and Wisconsin for the award year of 2017/18. To win this award, we provided our customers with a unique combination of excellent customer service, claims handling, and value in the car insurance products we sold over a three-year period! ValChoice® collects and analyzes millions of complaints and financial data points to expose which Insurance Companies provide policyholders with a true, overall value. Are you getting the value you deserve out of your insurance policy? Click here to check out our Auto Insurance! ValChoice® is the only company to provide consumers, agents and advisors with information on which home and auto insurance companies offer the best value: price, protection (claims handling) and service. The company’s analytics platform collects and analyzes millions of financial and complaint data points and delivers the results in an easy-to-use service that Forbes Magazine describe as "Carfax for insurance.". Using ValChoice, consumers are finally able to shop for insurance based on value rather than making decisions blindly based on price or advertising campaigns.